Time Magazine's most recent cover shows a faceless President Donald Trump with his hair on fire. The cover was inspired by the recent controversy surrounding columnist Michael Wolff's explosive book, "Fire and Fury: Inside the Trump White House." The cover's artist has depicted Trump in a negative light several times before. Time magazine hasn't shied away from using its covers to slam President Donald Trump. 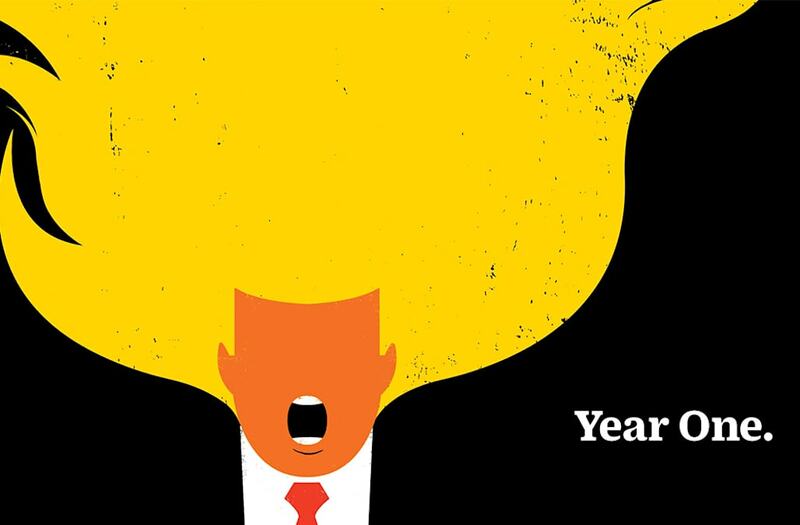 In its most recent edition, the magazine reinvented a previously used graphic to sum up Trump's first year in office: It depicts a cartoonish Trump with his hair on fire. Time said the cover was inspired in part by the controversy surrounding author Michael Wolff's explosive new book, "Fire and Fury: Inside the Trump White House," which ignited a firestorm in Washington over a series of wild claims about Trump and the early days of his administration. The buzz around Wolff's book has been enormous — it has dominated the news cycle, the White House has publicly denounced it, and Trump's lawyer threatened legal action to block the book's release. Edel Rodriguez, the artist behind the viral cover, explained its meaning. "We used to live where the United States was a pretty steady country, and now you wake up every day and try to figure out where’s the next fire, where do we have to go, what do we have to try to contain," Rodriguez said in an interview with Time. "It’s sort of this President that you’re always trying to contain, like a wildfire that’s moving from one place to the other at all times." The flames emanating from Trump's head are also meant to reference Trump's threat that North Korea would be "met with fire and fury like the world has never seen" if it continued to provoke the US. This isn't the first time Rodriguez depicted Trump in quite unflattering terms on Time's covers. In August 2016, Rodriguez imagined a faceless Trump — save the mouth — beside the caption "Meltdown," an apparent reference to controversies during the presidential campaign. Two months later, Rodriguez was the cover artist again, this time illustrating the completely melted and dripping face of Trump underneath the headline, "Total Meltdown." Shortly after Trump's inauguration last year, Rodriguez took his graphic Trump illustrations to a new level. 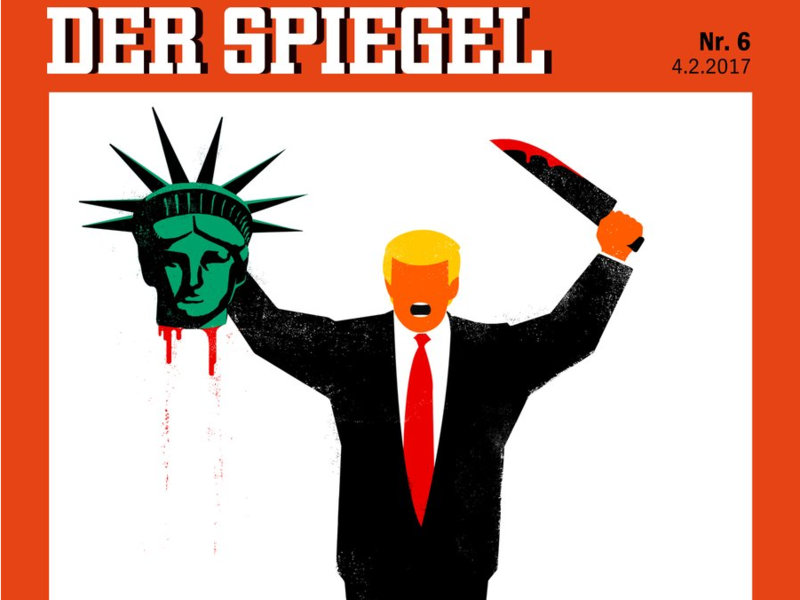 In a February 2017 cover for German news magazine Der Spiegel, Trump is shown holding up the decapitated head of the Statue of Liberty. Rodriguez, who emigrated to the US from Cuba as a political refugee when he was 9 years old, told The Washington Post then that he wanted to find a way to express his anger over Trump's travel ban. “It's a beheading of democracy, a beheading of a sacred symbol," Rodriguez said. "And clearly, lately, what's associated with beheadings is ISIS, so there's a comparison. Both sides are extremists, so I'm just making a comparison between them."